Tonight I went to see author Chris McDougal talk about his new book, Born To Run, not the story of Bruce Springsteen, but a wild tale involving his researches into the incredible endurance feats of a particular tribe in Mexico. He’s a good story-teller, and adds in a variety of information about theories of evolution of humans as ‘tribe runners’ that hunted animals by running them down, as well as a healthy dose of skepticism about the benefits of modern running shoes. He believes that we’ve been done a disservice by those who say that there’s no ‘correct’ running style; we don’t say that about swimming or most any other atheletic endeavor, so why would it be true of running? A look at runners of the past seems to indicate a stride that lands on mid-foot, and leans forward a little, to get the help of gravity to pull you forward. I personally made it out for a five mile run mid-day, getting up into the Forest Park trails. I find it very exhilarating to run on narrow trails, winding up and down, in and out along the ridge! 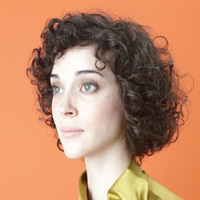 After hearing a ‘double buy it’ review from the Chicago team at Sound Opinions (show #181 5/15/09), I picked up the new CD by the act known as St Vincent, aka Annie Clark, titled Actor. She’s from Texas, has previously been part of Polyphonic Spree, and this is the second album. Kind of hard to describe this pop music, it initially sounds light but the lyrics throw some darker twists into the tunes. I liked it enough to pick up the first CD, entitled ‘Marry Me’, and I think they’re both quite good. Here’s a Pitchfork review (8.5). You can hear some tunes over on MySpace. Just so happens she’s playing Portland’s Aladdin Theater on Monday night, and I will be there. Update on the show: Annie came in with a four-piece band, bass, drums, violin/guitar, and a reed player. She stuck to guitars all evening. I enjoyed the show, mostly songs from the new album, and she’s an engaging character (though she stands a bit still and static on stage). She said she felt a bit like she was in a Jr. High talent show, as we were all seated in the small hall. There was an interesting vocal mic setup, where she actually had two mics, one that did more echo and processing on her voice, the other that sounded fairly straight. Some songs had lines alternating between mics. All in all a good show and an rising talent! And then, predictably, comes the P word: Look, he says, at Portland, Ore. Riding the aforementioned wave to Portland, which liberals hope is a harbinger of America’s future, has long been their aerobic activity of choice. But LaHood is a Republican, for Pete’s sake, the party (before it lost its bearings) of “No, we can’t” and “Actually, we shouldn’t” and “Not so fast” and “Let’s think this through.” Now he is in full “Yes we can!” mode. Et tu, Ray? Its government has been, intermittently, as progressive as all get-out, trying to use zoning, light-rail projects and high-density housing to cool the planet by curbing automobile use. Unsurprisingly, this has generated a bit of kerfuffle. Local congressman Blumenauer has offered Will a free trip out to Portland to see for himself. And Matt Yglesias challenges some of Will’s figures. According to PBOT bike program specialist Sarah Figliozzi, the smaller corral on Thurman signals a slightly different approach to the City’s business district bike parking plans. “In the future, what I see is a greater number of smaller corrals, about six staples each,” Figliozzi said. 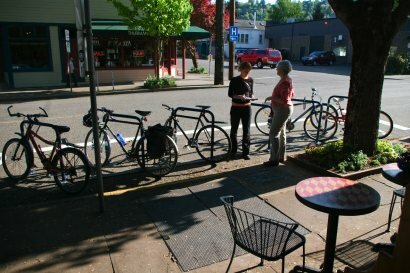 This approach would be more suited to Portland’s larger commercial districts, by spreading the commercial advantages of on-street bike parking around different blocks and businesses. “Generally, we get very strong support for the bike corrals from the business community, due to the increased customer ratio they make available — up to 10 people for each parking spot — as well as the increased street and curb visibility the corrals provide,” says Figliozzi. Hadn’t thought about it before, but it makes sense that if you can convert one car parking space into room for 10 bicycles, you just might get more shopping traffic. (On the other hand, most people on bicycles won’t be riding off with big boxloads of stuff!). I, like many others, first became aware of Ethiopian musician Mulatu Astatke from the soundtrack of Jim Jarmusch’s film “Broken Shadows” from a few years back. I got the Ethiopiques Vol 4 CD with his music, and recently came across this CD of new recordings by Astatke along with a band from England (described in one spot as a “noise-jazz collective”, but they’re pretty ‘in the groove’ here). I like the new recording – I think it’s as good as the older stuff. Mulatu Astatke is one of Ethiopia’s foremost musical ambassadors. Informed by spells living and studying in the UK and the USA, his self-styled Ethio-jazz sound flourished during the “Swinging Addis” era of the late ‘60s as he successfully fused Western jazz and funk with traditional Ethiopian folk melodies, five tone scale arrangements and elements from music of the ancient Coptic church. A little web searching turned up this recording of a 2008 live show where Astatke and the Heliocentrics play a bunch of his older tunes; a good place to get a sense of his sound. Went to see the local indie rock ‘legend’ with his band last night at the Doug Fir Lounge. Another band had to cancel their show for that night, so quick arrangements were made, and it was fun to see the band in a small venue. Things felt a bit rocky early on, but the material from the last album sounded very strong. “Emotional Rescue” (Rolling Stones, 1980) – a nice touch given their last title track… even included the “I will be your night in shining armor” falsetto! 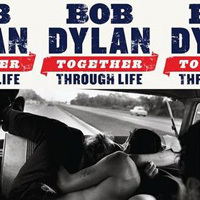 Bob Dylan’s new record, Together Through Life, came out last week. I’ve listened to it a few times. I have to say that I think that Pitchfork’s review and score of 5.4 out of 10 is reasonable. I like the overall sound and production; it’s warm and lively, and the accordian adds a lot of ‘spice’ without being overwhelming. But overall it’s just a basic blues record, and the lyrics have few moments that really stand out. It’s a nice listen (if you can deal with the fact that his voice is more shot than ever, but it fits the blues alright), nothing more. For the first few months I was haunted by a number: 52. It reverberated in my head; I felt myself a prisoner trying to escape its bars. For it represents the rate at which the income I earn, as a writer and as the director of an institute, is to be taxed. To be plain: more than half of my modest haul, I learned on arrival, was to be swallowed by the Dutch welfare state. And he finds some clear advantages to the Dutch system. In the United States, for a family of four, I paid about $1,400 a month for a policy that didn’t include dental care and was so filled with co-pays, deductibles and exceptions that I routinely found myself replaying in my mind the Monty Python skit in which the man complains about his insurance claim and the agent says, “In your policy it states quite clearly that no claim you make will be paid.” A similar Dutch policy, by contrast, cost 300 euros a month (about $390), with no co-pays, and included dental coverage; about 90 percent of the cost of my daughter’s braces was covered. Shorto covers much more ground than simply taxes and health insurance… well worth a read to get a sense of some of the unique aspects of the Dutch system – it’s not a simple matter of direct government control. And some things really are just culturally different; examining other cultures can help you see what’s special about your own.